Laser Dental Cleanings-What Is Laser Bacterial Reduction (LBR)? Laser dental cleanings are nothing new to McCreight Progressive Dentistry (MPD). In fact, Dr’s Jim and Wendy introduced the diode laser to the Yampa Valley 17 years ago. The majority of our clients choose “laser therapy” at every preventive care (dental cleaning) or supportive periodontal therapy (SPT) appointment or even during periodontal therapies (deep cleanings) with something that is called laser bacterial reduction, or LBR for short. So, what is it about the LASER that is so important to MPD and why do we recommend at least LBR to all clients? 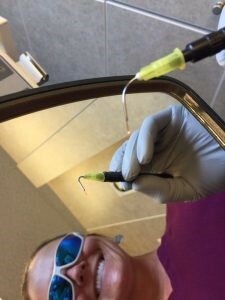 The diode laser tip that is used for dental cleanings for 17 years at McCreight Progressive Dentistry. All dentists and hygienists at McCreight Progressive Dentistry are certified from the Academy of Laser Dentistry to insure client safety and comfort. LBR is an excellent adjunct to preventative care in that the therapy in itself helps to reduce the amount of bacteria underneath the gums. As we all know bacteria can and will cause inflammation and infection and if left untreated may cause a bacteremia, gingivitis, or periodontal disease. And even worse SYSTEMIC DISEASES like (cardio vascular disease) CVD!!! 😳This works by introducing heat and denaturing or bursting the cell walls of the bacteria. 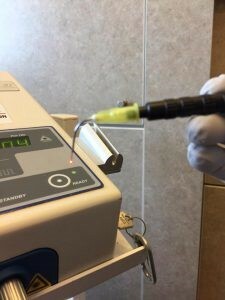 When used in conjunction with a periodontal therapy lasers also help to “grab” onto any necrotized (diseased) tissue caused by periodontal pathogens along with killing those harmful bugs. Team MPD likes this because it helps to reduce inflammation, infection, and decreases the healing time for all of our clients. 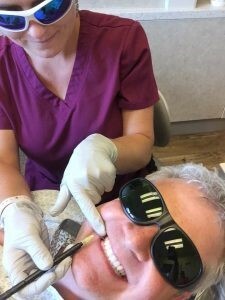 Dr Jim McCreight (co-founder of McCreight Progressive Dentistry) undergoes a laser therapy procedure called laser bacterial reduction (LBR) by laser certified hygienist and national/international dental hygiene lecturer, Mrs Jessica Berthelson, RDH.